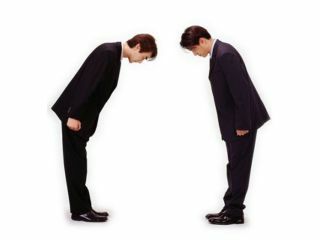 Japan's newest robot can recognise humans bowing and learn to do so by itself. We get to bring you news of plenty of robots that can do anything from playing sports to patrolling buildings, but one thing they almost all have in common is that they're really pretty dumb. Without human intervention, most robots these days can do absolutely nothing - they rely on us entirely for guidance, whether that's real time or in the form of being programmed in advance. Naturally, a day will come when machines can learn and teach themselves what to do; something Japan's National Institute of Information and Communications Technology is working on right now. The latest project from the Institute's Spoken Language Communication Group is a 155cm, 85kg robot that has achieved a degree of autonomous learning through gestures. The machine is yet to make its public debut, but reports [Subscription link] suggest it can understand the meaning of a human pointing a finger at something or - this is from Japan, after all - bowing to it. In return, the robot can repeat the same gestures in the appropriate circumstances - such as pointing a direction out and then moving that way - showing it has learned without formal teaching. While the development might not sound like much now, it's worth considering that rapidly evolving processing power and storage capacity could soon see an exponential growth in the real-world smarts of our tin friends.